Kismet native, Colton Chase recently took home the 5th Place Tractor/Trailer division award from the 35th Anniversary Shell ROTELLA® SuperRigs event, which took place in Tulsa, Okla. May 18-20. 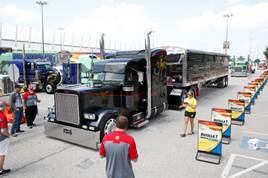 The Shell ROTELLA® SuperRigs competition is the premier truck beauty contest for actively working trucks. Hard working owner/operator truckers from across the United States and Canada compete for cash and prizes in excess of $25,000. Judges score the rigs on exterior appearance, design, detail/finish, originality and workmanship. In total, 24 working trucks receive awards for categories such as Best of Show, Tractor, Tractor/Trailer Combination and Classic.